During a 30-year career as author and illustrator, Jan Brett has crafted uniquely vivid spins on familiar folk tales, giving them a particular punch through her insistence on personally researching the places where she sets those stories. The fruits of a visit to Namibia can be seen in The 3 Little Dassies, in which the familiar saga of The Three Little Pigs transfers to something more like The Three Little Guinea Pigs. At least that’s what the rock hyrax (or dassie) looks like to us; to the African eagle, it looks more like lunch. Sister dassies Mimbi, Pimbi and Timbi are heading out into the world to build their own homes, and … well, you know the rest of the story. The enchantment in Brett’s version comes from the trademark intricate design of her characters and page borders. Follow Brett’s touring bus (pictured) to Woods Cross High School to meet one of the treasures of American picture books. 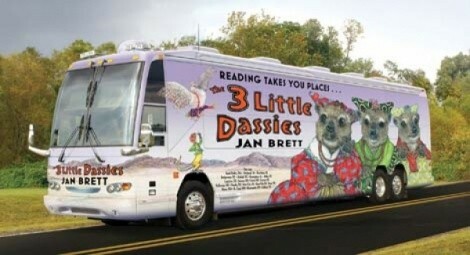 Jan Brett: The 3 Little Dassies @ Woods Cross High School, 600 W. 2200 South, Woods Cross, 801-451-2322, Oct. 19, 6-8 p.m., free.